We've seen all sorts of iRig products over the past couple of years, but we suspect that the original iRig audio interface, which enables guitarists to plug their instrument into Apple's iOS devices, has been the one that's shifted the most units. 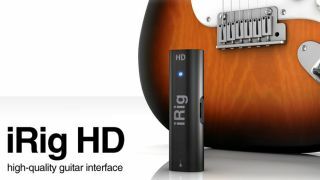 Now IK Multimedia has seen fit to launch a better-quality, more feature-packed version: iRig HD. Details are relatively scarce at the moment, but iLounge has seen the device at the in-progress CES show in Las Vegas and reports that it's capable of 24-bit recording and comes with a preamp gain control. What's more, it appears that this enhanced iRig connects to your iOS device's 30-pin or Lightning dock connector, with USB connectivity for PC/Mac operation also seemingly on the agenda. The audio quality of the original version was limited by the fact that it hooked up via your Apple hardware's headphones socket. A price of $99 is being mooted, with a release scheduled for the end of the first quarter of 2013.